I have a real odd problem and I am trying to understand why it exists. I am printing PETG, Cura 3.6. 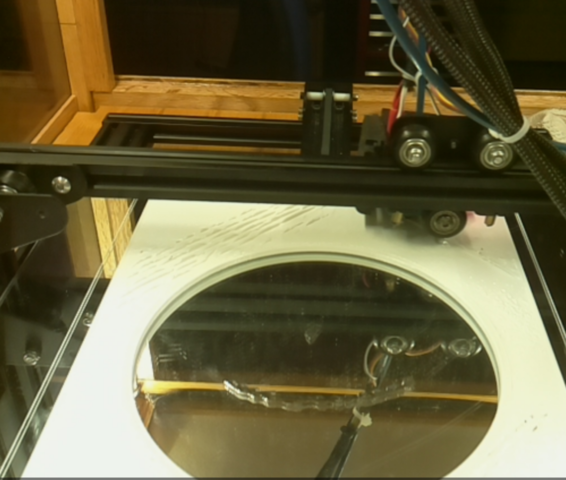 I am printing fairly hot at 260C. I have printed many little square pieces (coupons) to dial in all the settings and have what I consider a perfect finish in small pieces. The problem that I see happens in long individual lines of filament laid down. I have attached a picture of what looks very much like ripples in the sand on a beach. Looking real close, the bead seems to attach to the previous bead slightly above the current base level. This occurs for 4 or 5 beads in a row until the bead attaches to the base level again and everything repeats. The ripples are probably more than 1 mm high, the print thickness is 0.4 mm. The ripples get pressed down as the nozzle passes over them. I currently have a 0.4 mm nozzle and have specified a 0.4 mm trace width. I am tempted to reduce the trace width to 0.35 mm and I am also thinking I am possibly over extruding ever so slightly. The issue does not show in filler layers where the fill is set for 50%. Since this issue only happens with large models and only on top (possibly on bottom) wall layers, it is difficult to try and trace the issue with printing separate models with only one parameter changed. In this case it took 3 hours of printing before the issue showed up. Although any suggestion of setting changes is appreciated, more then anything I am trying to understand what causes this issue so I can make semi intelilgent choices on which parameters to change and why. Hi @jens3, I don't have any real good answer but I do know that if I am overextruding then I see ripples like that. It most often occurs on the first layer when the nozzle is too close to the bed. I don't normally see it for higher layers. Maybe the whole print is too hot, what bed temp are you using? I have found with PETG that you tend to get worse problems of filament sticking to the nozzle when really hot so now I am using a bed temp of 60, a first layer temp of 240 and then 230 for the rest. That's with a 0.4 nozzle and lines either 0.5 (walls) or 0.6 (infill). Finally, unless the object being printed has fine details, I normally use 0 fan to keep the strength up. Hope this helps. Thanks! I am using 75 for bed temp which was chosen mainly by adhesion. I set the nozzle distance of the first layer by reducing Z until I had a good solid first layer. I reduced bed temp until I could get the print off without destroying the bed (when cold). I found that nozzle temp didn't appear too sensitive and I could go down to around 240 without getting issues but chose 260 for better inter layer adhesion in models that have no overhang. I also use 0 fan. Could you please explain why you are using 0.5/0.6 for line width? As I said, I suspect some over extrusion but I am puzzled why it would only occur in long lines with shorter sections being perfect. Unless, I am slicing a model that requires particularly thin lines, I always use a line width of 0.5mm. Sometimes, I use 0.6mm for infill. To me this also looks like overextrusion, but it is difficult to see on the white. If you watch closely while printing, does the nozzle sort of "wade through the mud"? If yes, it's overextrusion. Probably you will also see accumulation on the nozzle, which then sags and gets deposited on various parts of the print, thus worsening the effect. Try printing a test plate of let's say 20mm x 20mm x 10mm, at 100% infill. And then play with the settings while printing: change flow rate, nozzle temperature, fan percent, printing speed, on the fly. Until you get it right? I usually print PET at 215...220°C, 30mm/s, no fan if the model allows it, 90°C bed temp. If I need fan for overhangs, then the temp has to be a bit higher, 220...225°C. My brand of PET has a tendency to overextrude when changing from printing long trajects to small details at high speeds: it seems the pressure in the nozzle can not change fast enough. The molten PET seems to be more rubbery than PLA, like chewing gum, and react slow. So normally on my UM2 the overextrusion happens on very short trajects only, not on long. It is when the printer has to frequently slow down to change direction. Then the built-up pressure in the nozzle can not immediately go down, resulting in temporary overextrusion. At least, that is how I understood it. It is not really 'wading' but getting close. It lays the new bead right very very close to the last bead. This makes the new bead attach to the previous bead in preference to the old layer. I spent quite a bit of time printing 'test plates' or 'coupons' as I call them and the profile is dialed in perfectly for those. The issue does not arise unless the individual lines laid down are several inches long - hence the difficulty of trying to dial in the settings and hence my lack of understanding as to why this is happening on long beads but not on short beads. Your explanation on over extrusion makes sense for your situation but unfortunately in my situation the over extrusion (if that is what it is) only happens on long runs, exactly opposite to what you are seeing. I would call PETG consistency more like a thick honey rather than chewing gum but I think we agree on what it is. I do see some of the over extrusion immediately at the start of a new line and for maybe 1/2 a mm - for the same reason that you are seeing it with your printer. This is a bit of an annoyance but manageable and it makes sense as to why it is happening. What I am seeing here makes no sense to me and until I can understand why it is happening on long runs but not short runs, it is very difficult to know what steps to take to lessen the issue. FWIW, I tried printing with 95% flow and the issue did not go away. It was reduced but I believe that was just the luck of the draw. I could definitely see under extrusion (at 95%) for the surface that did not ripple so I am pretty sure it's not related to over extrusion. I can't say for sure as I didn't watch the entire print process but I believe that the bottom layers, for whatever reason, did not ripple like the top layers. That doesn't make much sense to me because I am under the impression that top and bottom had similar parameters by default. As a final update for those that run into the same issue, I can now report that reducing flow to 95% did indeed solve the issue (when I reported I was at 95% in the last post I think I was at 98%). I have tried so many different things that everything becomes a blur. Oh, I also transitioned to Cura 4.0 in the process although I doubt that had anything to do with the final success. Good that you found a solution. If the flowrate is too high, from observation, also check if the filament diameter is correct (both the settings and the actual diameter), before you change the hardware-settings. For example if the filament would be 3.0mm instead of the standard 2.85mm, or 2.0mm instead of 1.75mm.